South Korea with its capital Seoul is located in Asia (Eastern Asia, southern half of the Korean Peninsula bordering the Sea of Japan and the Yellow Sea). It covers some 99,721 square kilometers (slightly smaller than Pennsylvania) with 51,181,300 citizens. Korean and English are the common languages used in South Korea. Interesting info North Korea is the only bordering country. South Koreais a country in East Asia. In recent years, a phenomenon known as the Korean Wave (or Hallyu) in which the popularity of South Korean film, television, music, food and other culture aspects has swept most of Asia and many other parts of the world has brought increased attention to the country. The landscape is mostly hills and mountains and wide coastal plains in west and south. The average density of population is about 513 per km². The climate in South Korea can be described as temperate, with rainfall heavier in summer than winter with cold winters. Potential threats by nature are Halla (1,950 m) is considered historically active although it has not erupted in many centuries, low-level seismic activity common in southwest and occasional typhoons bring high winds and floods. To reach someone South Korea dial +82 prior to a number. The local cellular networks are operated on 3G, 4G. Websites typically end with the top level domain ".kr". If you want to bring electric appliances (e.g. battery chaarger), keep in min the local 220 V - 60 Hz (plugs: F). The sign for the locally used currency Won is KRW. 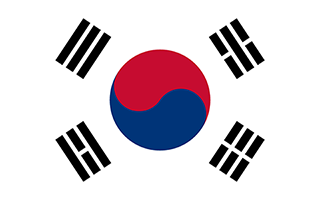 White with a red (top) and blue yin-yang symbol in the center; there is a different black trigram from the ancient I Ching (Book of Changes) in each corner of the white field; the South Korean national flag is called Taegukki; white is a traditional Korean color and represents peace and purity; the blue section represents the negative cosmic forces of the yin, while the red symbolizes the opposite positive forces of the yang; each trigram (kwae) denotes one of the four universal elements, which together express the principle of movement and harmony. An independent kingdom for much of its long history, Korea was occupied by Japan beginning in 1905 following the Russo-Japanese War. In 1910, Tokyo formally annexed the entire Peninsula. Korea regained its independence following Japan's surrender to the US in 1945. After World War II, a democratic-based government (Republic of Korea, ROK) was set up in the southern half of the Korean Peninsula while a communist-style government was installed in the north (Democratic People's Republic of Korea, DPRK). During the Korean War (1950-53), US troops and UN forces fought alongside ROK soldiers to defend South Korea from a DPRK invasion supported by China and the Soviet Union. A 1953 armistice split the Peninsula along a demilitarized zone at about the 38th parallel. PARK Chung-hee took over leadership of the country in a 1961 coup. During his regime, from 1961 to 1979, South Korea achieved rapid economic growth, with per capita income rising to roughly 17 times the level of North Korea. South Korea held its first free presidential election under a revised democratic constitution in 1987, with former ROK Army general ROH Tae-woo winning a close race. In 1993, KIM Young-sam (1993-98) became the first civilian president of South Korea's new democratic era. President KIM Dae-jung (1998-2003) won the Nobel Peace Prize in 2000 for his contributions to South Korean democracy and his "Sunshine" policy of engagement with North Korea. President PARK Geun-hye, daughter of former ROK President PARK Chung-hee, took office in February 2013 as South Korea's first female leader. In December 2016, the National Assembly passed an impeachment motion against President PARK over her alleged involvement in a corruption and influence-peddling scandal, immediately suspending her presidential authorities and establishing Prime Minister HWANG Kyo-ahn as Acting President. The impeachment was upheld in March 2017, triggering an early presidential election on 9 May 2017. South Korea will host the 2018 Winter Olympic Games. Discord with North Korea has permeated inter-Korean relations for much of the past decade, highlighted by the North's attacks on a South Korean ship and island in 2010, the exchange of artillery fire across the DMZ, and multiple nuclear and missile tests in 2016, and missile tests in 2017.